Thanks for this info, Cate! I just had a student come to me with this very issue and I never would have thought to change her embouchure this way! I will experiment with her and let you know how it goes! I had a prominent tear drop when I started taking flute seriously in my college days. I read “The Artistic Flute” and saw the photos of professional flautists playing off to one side or the other. I was stubborn and didn’t want to do that, so I exercised the muscles of my upper lip to smooth out the tear drop. I can play with a centered embouchure and an elliptical aperture. Some other professionals think I’m crazy, but it worked for me. Any thoughts? Very interesting story. I’ve never heard of anyone working on eliminating the teardrop in their top lip. Kudos to you for accomplishing that. My biggest concern has always been that many kids get steered away from flute by a non-flutist band teacher because they have a prominent teardrop. I have even had people tell me they wanted to play flute when they were young, got steered to another instrument they didn’t feel an affinity for and now no longer play anything at all, but wish they had been able to study flute. As you said, there are many prominent flutists who play off to one side or the other. To my mind, the placement of the aperture isn’t an issue as long as the embouchure functions as it should. There are options for kids who have a teardrop in their top lip. What type of exercised did you to get rid of the tear drop? The high school I went to had over 200 clarinet players…. And then later on I come to find out that she let this really popular and successful clarinet player from the top band switch over to another instrument (it was the flute)… I just about exploded when I learned this. Thank you! I just put anew student on flute and she has the tear drop. But she made such a clear big sound right away, she lit up and immediately wanted to pick flute for her instrument. How could I say no? I’m so glad to hear it’s not the end of the world to put a student on flute if they have the tear drop! My daughter has played flute for a full year now and is loving it! Her director e-mailed today and said she is having trouble playing in the lower register due to a tear drop in her embouchure. He is pushing changing instruments as he has only seen one successful person play with this and it took hundreds of hours of extra practice. My kiddo is so sad tonight. I would love to find someone in our area to help her explore a change in embouchure before giving up the instrument. I’m working with a beginner right now who has a teardrop. I’m confident in her success, since I have one too. I didn’t even realize why I played slightly off center until I was well into conservatory. Kudos to my teachers 🙂 ! When encouraging a “teardrop student” to shift their aperture to the left, should I also have them shift the flute slightly to the left? Or is that not necessary, given the cut of the embouchure hole that you were talking about? You do need to encourage the student to center the blow hole with the center of the aperture they are shaping, rather than the center of the lips. Hope that helps! That would explain why I make a clearer sound when the blow hole is off center. I never knew that. My high school band teacher told me that I didn’t have the lips for flute but I’m taking lessons now and love it! 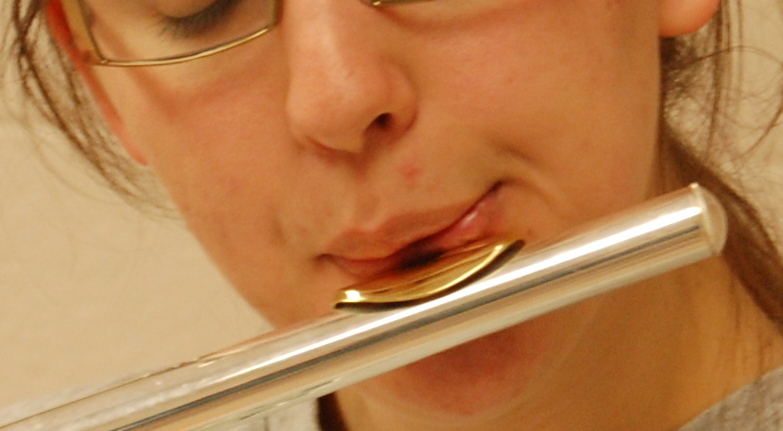 There’s a very prevalent belief among non-flute playing band teachers that you absolutely must be able to blow through the center of your lips to play the flute. And I will tell you that there are and have been many fine players who have an off-center embouchure. Denis Bouriakov, the current principal flutist of the LA Phil, has one of the most off-center embouchures I have ever seen. And he is an absolutely magnificent player. I’m delighted you are now taking lessons and enjoying your experience playing the flute.